“Kevin’s Spaatz Award was issued on the 9th of December, 1966. At that point in time, I had about three stripes. I lived in the Orlando area and Kevin was in Jacksonville, so our paths didn’t cross until I attended the Florida Wing Cadet Command and Staff School in the summer of 1967. The school was about a week long and was held just prior to the Summer Encampments at the Orlando Air Force Base. “The CCSS ws a tough program with a lot of emphasis on leadership. Each barracks was headed up by an advanced cadet—in my case, Cadet Colonel Kevin Frye. As a C/TSgt, I was about the most junior cadet present, looking to earn a staff slot after having been a doolie the year before. Kevin was impressive. He had a leader persona. His uniform and appearance were impeccable. He was strict but fair as a disciplinarian. I remember walking past his room on a number of occasions and he would be sitting at his desk writing. He said he kept a journal. He said his ambition was to become a Naval Aviator and fly jets off an aircraft carrier. “The night before graduation, he was ambushed as a token of our appreciation. Stripped to his t-shirt and skivvies, tied to an unmade rack, he was hoisted up and ceremoniously carried over to the female barracks. Of course, his threats were not dissuasive enough. The girls did a very thorough number on him with lipstick and shaving cream. I have pictures somewhere to prove this story. 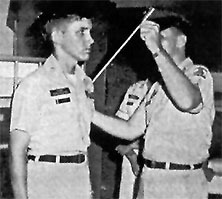 Kevin inspects a cadet at the Florida Wing encampment, 1967. “The remainder of what I know about Kevin is somewhat sketchy. He went to college for a year or two, but the lure of combat aviation grabbed him. The Army had a Warrant Officer program whereby a young man could become a pilot and a college degree was not required. Apparently, Kevin wanted to fly in the military more than anything else. He joined the Army, completed pilot training at Ft Rucker, AL, and flew helicopters in Vietnam. 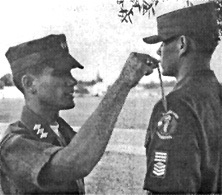 “My Spaatz award ceremony was held in mid-1970. The USAF Liaison Officer told me that following my luncheon he would be traveling up to Jacksonville to present the Air Medal to Kevin’s parents; the helicopter Kevin was co-piloting had been shot down and he was killed in action. On 28 July 1970, Warrant Officer Kevin Mark Frye was serving with C Company, 1st Battalion, 9th Cavalry Regiment, 1st Cavalry Division, in Long Khanh Province, South Vietnam. On that day, the attack helicopter in which WO1 Frye was the copilot, experienced engine failure. WO1 Frye and the pilot, CWO2 David E. Zimmerman, died in the crash. Both bodies were recovered. The name Kevin M Frye is inscribed on Panel 08W Line 062 of the Vietnam Veterans Memorial Wall. WO1 Kevin M. Frye has Honoree Record 10664 at MilitaryHallofHonor.com.